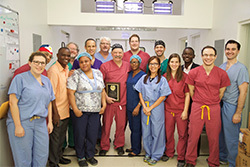 FOT is looking forward to working with its members to sponsor surgeon travel to Haiti. We are now in a position to solicit our membership for those interested in joining teams that will serve as educators and clinicians for periods of a week at Adventist Hospital in Port au Prince. Additionally, FOT is soliciting interested members who are willing to host Haitian residents for a period of one week to observe at their institution. The following article appeared in the May 2018 New York Presbyterian newsletter and is available online here. A Team of orthopedic surgeons at NewYork-Presbyterian/Columbia University Irving Medical Center are helping to improve musculoskeletal care in Haiti. Long before the 7.0 magnitude earthquake hit Haiti in January 2010, the small island nation struggled to adequately provide healthcare. The most impoverished country in the Western Hemisphere, almost half of the population had no access to health services, according to the World Health Organization. The quake shredded what was left of the tattered healthcare system — hospitals building collapsed, and already strained non-governmental organizations (NGO) worked to care for the injured. But tragedy gave rise to new hope, as the international medical community rallied to provide emergency care. In the years since the earthquake, one team of orthopedic surgeons at NewYork-Presbyterian/Columbia University Irving Medical Center continue to help as the Haitian medical community attempts to rebound and grow. With support from NewYork-Presbyterian, Columbia University Irving Medical Center, and the Foundation for Orthopaedic Trauma — a professional organization dedicated to orthopedic education and research, Dr. Rosenwasser takes a team of physicians and nurses on a weeklong medical mission to the Hôpital Adventiste d’Haiti in Port-au-Prince, just 16 miles from the epicenter of the earthquake. This year, the team — three orthopedic surgeons, three orthopedic residents, one hand surgery fellow, two scrub nurses, and a research assistant — set out to provide care for congenital cases and injuries. Dr. Rosenwasser says, although there are many Haitian orthopedic surgeons in the United States and other countries, few remain on the island. Haiti has a physician shortage for all medical specialties, especially orthopedic surgery. A 2002 survey by the Surgeons d’Haiti Orthopedic and Trauma found there were 67 practicing orthopedic surgeons in Haiti. In the years since the earthquake, that number has almost doubled to 127. The orthopedic team at NewYork-Presbyterian/Columbia is just one group of many medical organizations from around the world going to Haiti and other medically deprived countries to provide care throughout the year. In addition to orthopedic missions, NewYork-Presbyterian, and its academic partners Columbia University Irving Medical Center and Weill Cornell Medicine, help sponsor tropical disease missions to Brazil, diabetic care missions in Ghana, and HIV/AIDS treatment missions in India. Each mission coordinates with a local hospital or medical clinic to gather patients in need of specialized care. “Each day, there was a mass of humanity that gathered. There was always more patients than we could take care of. But those cases are passed on to the next team. Hopefully, they have the expertise to provide care for those patients,” Dr. Rosenwasser says.